Lots of Boot Camp coverage this week, but first some news on the Intel front. Intel will be cutting prices on Core Duo processors on May 28, so we may see Macintel price reductions shortly thereafter. Also, Intel has begun shipping slower single-core CPUs in Japan. These 1.4-1.7 GHz CPUs could show up in iBook replacements. All is not well on the Boot Camp front. There are reports of serious crashes and Macs turned permanently into Windows PCs - shudder. There are also several step-by-step tutorials on how to avoid the problem. As for Windows viruses and other malware, unless Windows somehow mounts the Mac partition, it should be virtually impossible for a Mac running Win XP via Boot Camp to see any damage to the Mac side. Whew! There are also more developments with Parallels Workstation, which we believe is a vastly superior alternative to Boot Camp, since it doesn't require restarting one operating system to use the other. "If the thought of buying a Core Duo Apple machine that can boot Windows XP is making you itchy to go buy one, hold your horses. "The price of Intel Core Duo chips is set to plummet on the 28th of May, and there's faster chips coming along anyroadmap. Those include the 2.33 GHz T2700, but this is only the start of better things from Chipzilla later this year." The article details price cuts. Link: Wait Until June Before You Buy Your Macinteltosh? "Intel's as-yet-unannounced Celeron M 4xx series - the first budget-priced processors derived from the chip maker's 'Yonah' core - have gone on sale in Japan, according to local news sources. "As Reg Hardware exclusively revealed in January, Intel is preparing a trio of single-core Yonah-based Celeron Ms: the 410, 420 and 430, clocked at 1.46, 1.60 and 1.73 GHz, respectively. All three are fabbed at 65nm, contain 1 MB of L2 cache and support a 533 MHz frontside bus clock frequency." "There are millions of iMacs still in use - my mother in law, for example, has one we helped her get in, I think, 98 or 99 and uses it every day for email, recipes, internet access, and some Bridge games she's fond of. ...older gear continues to work, the long product life cycle discourages early product replacement, and most Mac users have only one computer. "Her iMac is part of an important underground Macintosh phenomenon: Apple may only get a bit more than 3% of new sales dollars, but it has something in the range of 12% to 15% of total users. There are three closely related reasons for this: older gear continues to work, the long product life cycle discourages early product replacement, and most Mac users have only one computer. "In the PC world new generations come along about every six months to a year. As a result the typical home user accumulates several machines while corporate evergreen policies usually aim to refresh the desktop every 18 months for power users and every 24 to 30 months for people perceived to have more limited needs. "In contrast the PPC Macs now being phased out in favor of the Mactel line have had a marketing life ranging from five years for the PowerBooks and G5s to two years for the mini. "One of the effects of Mactel is that this traditional longer product cycle for the Mac will be going away: a decision to use PC chipsets and architectures is also a decision to adopt the PC lifecycle. "As a result that long term Mac user phenomenon will be wiped out, shrinking the aftermarket for Mac upgrades and software in the short term, and bringing Apple's usage share down to its market share in the longer term." Other editor's note: I'm very happily running OS X on a 2002 dual 1 GHz Power Mac G4 as I type this into Claris Home Page using Classic mode. My other workhorse is a 2004 1.25 GHz eMac, and when in the field, my 2001 PowerBook G4/400 is still an adequate performer under Tiger, although it's about due for replacement with something faster. "Any talk of Apple's Boot Camp software exposing the company's operating system to security risks is just hype and should be ignored, according to analyst firm Gartner. "In an advisory published on Gartner's website last week, research VP Michael Silver said administrators should ignore any suggestions that Apple's move to Intel processors will expose the system to security vulnerabilities. "Silver said in the advisory: 'All users should ignore any hype about the possibility of exposing the Mac OS to more viruses or worms. The Mac software will be located on another partition within a different file system; thus, running Windows on a Mac will not expose the Mac software to more malware.'" "Was it just me, or did anyone else catch those little jabs at Windows on the Boot Camp installation page? 'If your computer becomes infected, well, what did you expect?' and so on. "Well, we know that the folks over at Apple actually wanted to say a lot more than that, so we rooted around in the trash at the Jack-in-the-Box closest to Apple HQ in Cupertino until we found...."
"Over on the Apple.com discussion boards, a number of people are reporting that Boot Camp - Apple's new beta software that allows Intel-based Mac owners to install Windows XP - is causing some serious problems. "To be precise, the common crisis is that after partitioning their hard drives and installing Windows XP - which seems to work fine - these people find they can no longer boot back into OS X." "Some Mac users are reporting problems with Apple's Boot Camp, the software that lets Intel-based Macs run Windows. Ironically, some users have said been stuck with Windows, with their hardware left unable to reboot the Mac OS. "In a discussion thread on Apple's technical support Web site, more than a dozen users reported that Boot Camp successfully partitioned their hard drive and allowed them to install a working version of Windows, but then would no longer allow them to switch back." 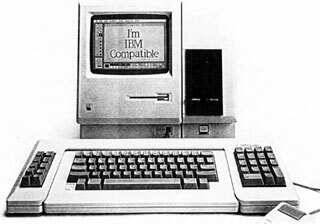 "Some folks would have liked nothing better than to marry the Macintosh off to the PC world right from the start. "In 1985 Dayna Communications came out with something it called the MacCharlie (right). This contraption was an expansion box that fit around the Mac so you could run PC and Mac software. The PR at the time trumpeted how users could now enjoy the best of both worlds. But it was an expensive gimmick that caused the system to run like molasses. Even worse, it cost more than a thousand dollars. "Boot Camp was a stroke of genius. Period. "Apple's not endorsing Windows. It's endorsing the idea of Windows running on a machine that it sells. "But dare I say this aloud? Boot Camp is a gimmick. A smart gimmick but a gimmick nonetheless." "Today's commentary piece by Charles Cooper, an editor for CNET.com.au sister site CNET News.com, sparked some interesting debate down here in the CNET bunker. Cooper believes that the ultimate result of Apple's new Boot Camp software will see a raft of current Windows XP users making the jump to Mac OS X. He argues that since Windows users now have the opportunity to sample Apple's fruits without giving up their trusty Windows applications, many will be tempted to jump ship altogether. "I think he's missed the boat on this one, and here's why. Cooper assumes that the existence of Boot Camp alone will be enough to entice significant numbers of Windows XP-based PC users to shell out a few grand for a new Mac - now that's wishful thinking! In my opinion, not many will even bother. "Dual booting Windows XP and Mac OS X through Boot Camp is superfluous, as you're forced to reboot each time you switch between operating systems, and the Windows XP partition can't read any of the files you've saved under your Mac OS X partition. So what's the point of it, when I could just stick with my current Windows XP-based PC and not worry about Mac OS X altogether? Does OS X really offer any applications that would entice me to purchase a new Mac and put up with the tedium of Boot Camp? I doubt it." "Depending on how Apple users install Windows, the Mac operating system may be able to see and use some files from the Windows side without having to shut down and reboot. This could open the door for potential mischief. "Now that new Apple computers can run the rival Windows operating system, users will be able to run a wider variety of software - primarily games - from one machine. "With 'Boot Camp,' software allowing Apple users to switch from the Macintosh operating system to Windows, consumers no longer will be locked into an either/or proposition. They can have the Mac OS, widely regarded as technologically superior, and Windows, which has far more software titles. "Once one of the most celebrated rivalries in techdom, the relationship between Microsoft and Apple has been peaceful for about a decade. Despite its warfare imagery, Boot Camp is another bridge. But unlike previous acts of détente, including Microsoft's 1997 investment in Apple, last week's move has more potential security risks." "You can take the PowerPC chip out of the Mac, but you can't take the fear out of Mac owners. "The news last week that Apple's Boot Camp software would allow users to run Windows on its new Intel-based Macs kicked in a predictable fear that Windows would open Mac users to the wonderful world of viruses so familiar to Windows owners. "But it just ain't so. Talk about viruses on Macs is just hype - or perhaps it comes from the rooted belief, right or wrong, that Macs are immune to viruses. "With Boot Camp, Mac software will be located on another partition on the hard disk within a different file system, so running Windows on a Mac will not expose the Mac or data on the Mac side to any malware. "A member of the OSx86 Project has managed to get a pre-release version of Windows Vista to boot on an Intel-based Mac. "'A few weeks ago we launched our tongue-in-cheek contest to dual-boot Windows Vista on an Intel Mac, but little did we know that Apple was planning on dropping the Boot Camp news a few days later,' said contributor 'Mashugly' from the OSx86 Project. "'Nevertheless, Vista has proved a challenge even with Boot Camp so we were fairly excited when 'AirmanPika' let us know about his success with installing and booting Vista.'" "I've been fiddling with Boot Camp on a MacBook Pro 2 GHz since its release, and I'm ready to settle in: I can just expect games to work with all their gee-whizardry enabled and the highest widescreen resolution. Half-Life 2, Dungeon Siege II, Tomb Raider: Legend, and Oblivion: all working wonderfully. The one question remains: which of the zillion MMORPGs whose doors are now opened do I want to explore? (Yes, I play World of Warcraft, and yes, I do so only under OS X). "I've given up on the wireless connection for anything but casual online browsing or downloads (such as small patches) - various folks have suggested Windows XP's wireless capabilities are 'flaky', and I've no real desire to fix it when I can wire into my router easily enough. Last night, I started a free trial of R.O.S.E. Online (which is at least entertaining enough to want me to play for a second day), and I'm debating City of Villains and this week's Auto Assault (though, fie!, do I wish there were demos). "My final notes on the Boot Camp experience...."
"The big technology news this past week was Apple's beta release of Boot Camp - software that allows Windows XP to be installed on three Macintosh computers. (The ones built with Intel chips, instead of PowerPCs.) The idea is that people who prefer the Mac but need to use software that's only available for Windows (and there's plenty) could have the best of both worlds. "Today, according to Information Week, the Mac's desktop share is less than 5%. But Boot Camp, say some people, will overcome that hurdle and help propel the Mac into the mainstream. Businesses will buy Macs for their employees, confident they'll be able to run all the needed applications. "Gamers, who have pretty much shunned the Mac because the gaming picks are slim (to say the least), will be able to run those games on their Mac hardware. In fact, from what I've read, those games will run pretty darn well, too. "Could this be the thing that gets Windows users to try the Mac and, eventually, convert? Wall Street apparently thought so, and Apple's stock took a jump after the announcement. "You know what? Boot Camp isn't going to propel the Mac into the mainstream. If anything, it will get Mac users to switch to Windows. Sure, it'll be terrific for Mac fans not wanting to give up their machine of choice but find more and more they need to use Windows. But Boot Camp doesn't offer any kind of compelling argument for PC users to buy Mac hardware." "Your Macintosh is now a certified honest-to-god Windows PC. The Mac Anti-Christ, Windows, can be used on any Mac running an Intel chip with Apple's new Boot Camp software. I asked myself who would do such an awful thing to the Mac? It must be Microsoft trying to sell more copies of Windows XP before they release there new operating system, Vista, in the fall. Sadly, Bill Gates is not behind this. Steve Jobs and his apple cronies came up with this software themselves. "Running Windows is possible on the Mac is by the new program Boot Camp. Unlike Microsoft's Virtual PC that runs as a program inside of OS X, Boot Camp runs before either operating system is loaded. When the computer is turned on the user will have the option of running Windows or OS X. Essentially, the new Intel-based Macs can support Windows on it's own, Boot Camp simply takes care of most of the leg work involved in the process allowing easy access for the general consumer. There is no direct swapping between operating systems. The only way to switch between the two is to restart the computer. The two operating systems are keep apart from one another. Each sits on there own hard drive or partition. So in the likely chance that windows gets a virus all your Mac files will be safe while your windows files get ravished. "To me there is little need for this program, if you bought a Mac, why would you go back to Windows? OS X is the faster and the safer choice between the two operating systems. I could see a use for this in the past when Macs were not very windows compatible. Since OS X came out Macs are very compatible with windows. As I write this I'm swapping photos with my friend on a Windows PC, compatibility not being an issue. In my opinion, a Mac can do everything faster than a Windows equivalent PC could do." "It may take longer to read about the installation process than to complete most of its steps. The most time-consuming part is the lengthy time required by Windows XP's installation routine. On my 2-GHz Core Duo MacBook Pro with 1 GB RAM and a 5,400-rpm, 120 GB hard drive, Windows XP Pro's installation took more than 90 minutes - nearly twice as long as the average time needed for a Windows XP clean installation. (Some other testers have reported 45-minute XP installation times, though.) The good news is that's not at all a harbinger of XP's performance on your Mac. When all is said and done, Windows XP runs very quickly on Intel-based Macs." "Enter Boot Camp, a new system utility that helps you partition and install Windows XP on your Intel Mac. Boot Camp does all the heavy lifting for you. You won't need to open the Terminal and hack on system files or wave a chicken bone over your iMac to get XP running. This free program makes it easy for anyone to turn their Mac into a dual-boot Windows/OS X machine. "Running Boot Camp guides you step-by-step through the entire installation process, including upgrading your Mac's Firmware, creating the Macintosh Drivers CD to make XP work properly with your Mac's hardware, and using the Boot Camp Assistant to partition your hard drive and install Windows XP. You'll also learn how to avoid common pitfalls (such as previously partitioned drives and wrong disk permissions). And finally, you'll find out which Mac functions don't work in XP and which XP features backfire on a Mac. With this invaluable guide at your side, you'll finish configuring your dual-boot Mac in as little as two hours, avoiding numerous hazards and annoyances along the way." "On April 5, Apple strengthened the case for Mac Intel users switching from OS X to Microsoft's Windows XP, at least some of the time, with the release of an initial beta of Boot Camp. During eWeek Labs' tests, the beta software guided us smoothly through the process of turning an Intel-powered Mac mini into a dual-boot Windows XP Service Pack 2/OS X 10.4.6 box. "Even with the limitations of dual booting-and there are limitations-Boot Camp offers Apple hardware buyers more choices, and we always welcome more choices. Boot Camp principally represents a bid by Apple to sell more hardware, but we also welcome this gesture of openness. If, to boot (no pun intended), Apple became amenable to allowing OS X to run on non-Apple hardware, the strategy could go a long way toward improving the company's case for itself in enterprise IT." "Apple Computer's announcement of Boot Camp, a way to run Microsoft Corp.'s Windows XP on Apple's Intel-based Macintosh computers, raises the question: Why run Windows on a Mac? "The answer is simple: Some programs exist solely on the Windows platform. Mac users who want access to those applications need help. "But there is more than one way to put Windows onto an Intel-based Mac, it turns out. 'Virtualization software' - such as the still-in-Beta version 2.1 of Parallels Workstation, a program from Herndon, Va.-based Parallels (www.parallels.com) - also can do the job." "Parallels Workstation's most obvious advantage is its ability to run both operating systems simultaneously. Most people probably would rather not restart their computer just because they need to access an application. The Windows OS runs inside a Mac window and users can easily and quickly switch back and forth between operating systems. "For years, my desk has been cluttered by two computers - one Macintosh and one PC. It's been an arrangement of necessity, as I prefer the Mac but sometimes need a Windows machine for work. "So it was with great interest that I read about Apple Computer's launch last week of a program allowing newer Intel-based Macs to boot Microsoft's Windows operating system. A day later, another company unveiled software that runs Windows in Mac OS X at nearly full speed. "In both cases, software emulation isn't required, because the new Macs share the same hardware brains as Windows PCs Unlike Microsoft's Virtual PC program that lets some Windows programs run on my old PowerPC-based Mac, there's no significant performance hit. "The major difference between Apple's Boot Camp and Parallels Software International's Parallels Workstation is that the latter allows the user to seamlessly switch back and forth between the systems without restarting. Boot Camp requires a decision at startup - if you want to run the other OS after that, you need to reboot." PR: Parallels Workstation is not simply a "dual-boot" solution; rather, it empowers users the ability to use Windows, Linux and any other operating system at the same time as Mac OS X, enabling users to enjoy the comfort of their Mac OS X desktop while still being able to use critical applications from other OSes. Improved, easier to use interface. Broad OS Support: Use any version of Windows (3.1, 3.11, 95, 98, Me, 2000, NT, XP, 2003), any Linux distribution, FreeBSD, Solaris, OS/2, eComStation, or MS-DOS in secure virtual machines running alongside Mac OS X. Great Performance: Driven by full support for dual-core processors and Intel Virtualization Technology (included in almost every new Intel-powered Mac), virtual machines created using Parallels Workstation 2.1 Beta offer near-native performance and rock-solid stability. Unmatched Ease of Use: Download the program and install it with a single click. Build a virtual machine in seconds using helpful wizards. Configure virtual machines using a simple web-inspired interface. Works on Any Intel-powered Mac: Any Intel Powered Macintosh running OS X 10.4.4 or higher is compatible with Parallels Workstation 2.1. Participate in this important Beta program! Get your copy of Parallels Workstation 2.1 Beta3 for Mac OS X now.